The 24 day challenge is a food based program. It focuses on eating clean, healthy foods such as fruits, veggies, lean meats/protein, complex carbs and healthy fats. The first 10 days are a very mild cleanse. This is NOT a juice only diet - you eat 5-6 healthy meals and take a probiotic, fish oil, fiber drink & a cleanse tablet each day. You cannot drink coffee on the challenge but have no fear, Spark to the rescue! Spark is a vitamin packed, flavored drink you mix with water - it's awesome!! Then the next 14 days you move into what we call the "max phase" where you continue the same eating of 5-6 healthy meals per day and you take core vitamins. Essentially the cleanse phase cleans your system and gets you ready for the max phase which is the optimal nutrition part. If you want to read about my first 24 day challenge experience, click here. Those are my first ever results from my challenge. And in case you are wondering, the challenge is not meant to be a program where you lose the weight and then fall off the wagon. It's rather a kick start to a healthier lifestyle change that you continue on past the 24 days, which is what it has become for me. If you are at all interested, shoot me an email or click the link below. It's not too late to join us for the All In January 2017 challenge that will begin January 2nd (or the 9th for several of our group members). [one] Pixley - Greenich Striped Knit Top. 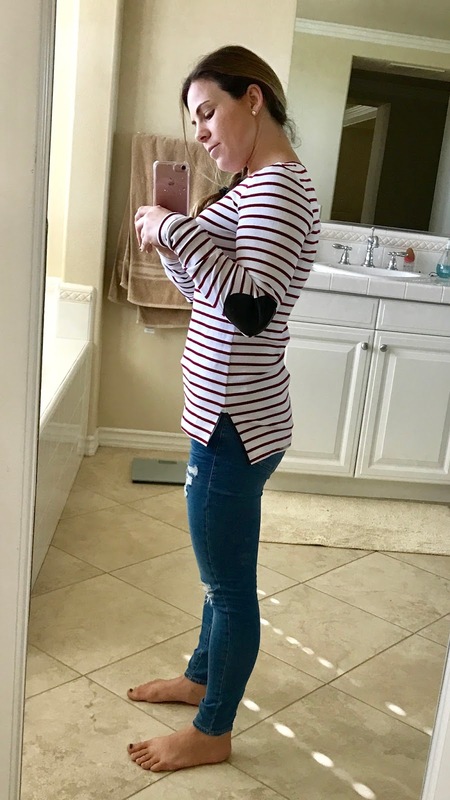 I am a lover of stripes so I was excited to see this top in my fix. Plus, I had pinned it on Pinterest and my awesome stylist definitely picked up on that. The top is a little more clingy and fitted than I had liked. I loved the burgundy stripes and the leather elbow material was such a cute little added touch to the shirt. This item was the lowest price in my box at $48.00. [two] Andrew Marc - Kayseri Faux Leather and Knit Moto Jacket. I will be honest, right away, I knew I would not keep this. Being a mom of three little kiddos, I rarely make it out on the town & when I do, I don't really dress up too much so I am guessing this jacket would just sit in my closet most of the time and not get much use, if any. Sadly, I had to return. [three] Unpublished - Athenia Button Back Top. So these polos are sooooo in style right now. So much so that I got two for Christmas!!!! LOL! Unfortunately, I wasn't completely, madly, had to have it, in love with this top so I returned. But the colors and buttons on the back of the shirt were on point. [four] Fate - Salena Mixed Material Pullover. When I first saw this shirt, I thought, "okay this could be cute." When I tried it on for the first time, I thought, "no way." Then, when I tried it on with my favorite black leggings, I was blown away. I LOVE everything about this shirt. Love the color. Love the "looseness" of it. Love the length of it. Love the pocket on it. Love the mixed material at the bottom of the shirt. 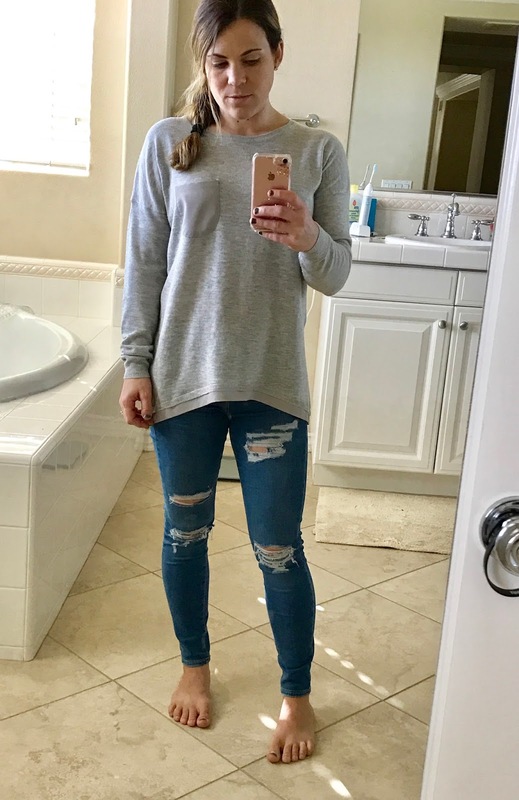 It looks amazing with black leggings and I even tried it on again to snap some pics, and it looked great with my new jeans (on sale at Nordstrom right now for $45 BTW). Perfect to dress down w/jeans or dress up to go out. This was a MUST. [five] Loveappella - Leila Knit Dress. 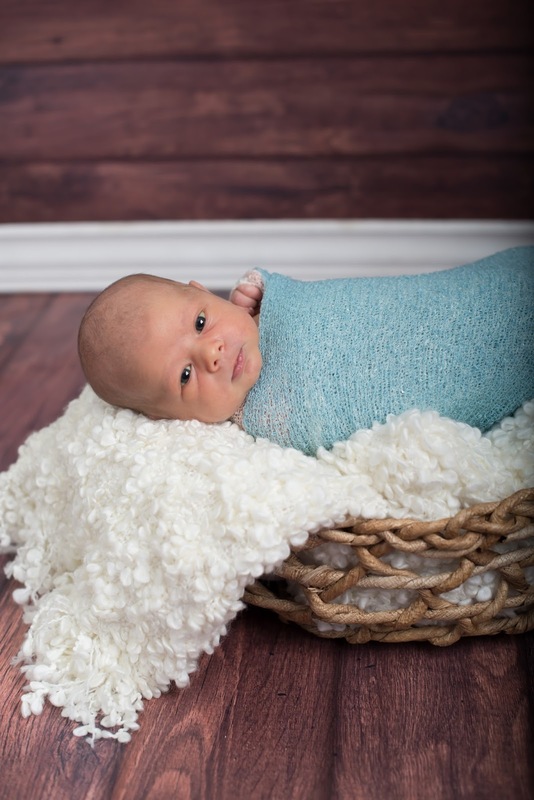 This was super soft and cozy, very cute pattern & loved the material, however, not my style at all so I could not keep this. Well it's been over a year since I visited my blog - wow that is so sad! But here I am, back in action, ready to give a quick update on my life! 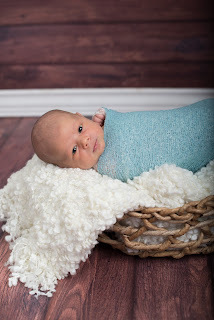 Since I took a break from my blog, we completed our family. Dylan, our youngest, is already a year old! 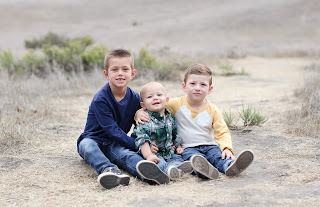 Owen just turned four & Mason is five. I am still a stay at home mom, working part time as an independent distributor for AdvoCare & I also have a little side gig doing some accounting work for a property management company in Newport Beach. Okay, I will be honest, my part time gig gets me out of the house for just the perfect amount of time each week which is what I love about it most. Those hours of freedom are so valuable. And as for AdvoCare, well this past year has been kind of exciting. I attended my first Success School at Dallas Cowboys Stadium with over 20,000 others in July 2016. And then, the hubby and I earned an invitation only, all expenses paid training at the corporate office in Plano, TX in August. Both of those trips were filled with lots of learning & very eye opening about our future and this opportunity. We are definitely excited about where this is headed. Oh and if having a baby and working wasn't enough, we moved over the summer! Okay, maybe it wasn't a big move, but we did move about 1/4 of a mile across the street to a new home which we are loving! And now here we are, almost Christmas, a year and a half later. I am so lucky with all my family and friends in my life. I have met some incredible people over the past year and learned so much about myself. 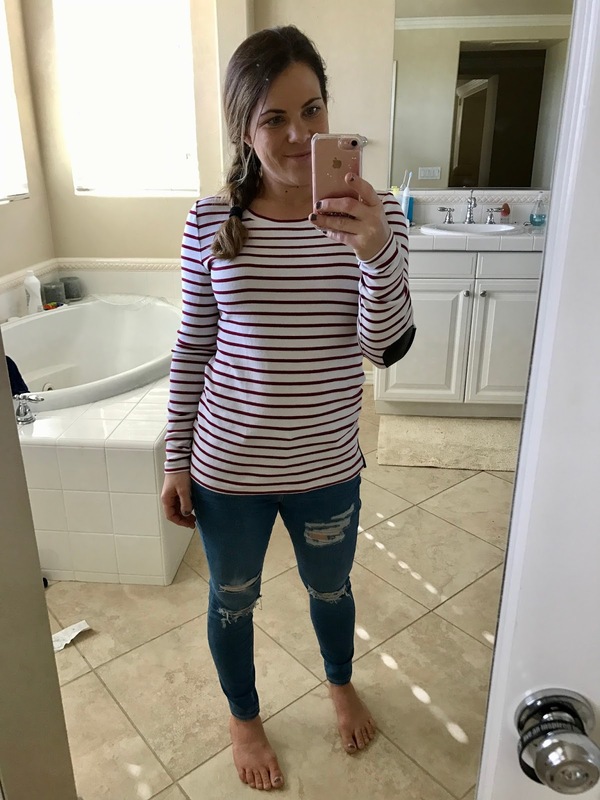 Here is my second MATERNITY stitch fix.....Enjoy!!! [one] Staccato - Sarina Open Cardigan. This cardigan was super cute and I loved the pattern, however, it was too baggy and big for my liking. [three] Loveappella Maternity - Bob Knit Maternity Tank. I LOVED this tank top. The stripes are definitely my cup of tea and the colors were great too. With the hottest months of the year coming up, I knew I had to keep this. The necklace was super cute also but I didn't want to spend the extra $$. [four] Market & Spruce - Nolen Printed Detail Henley Tank. From first glance, I thought this top was a winner because I loved the light gray color with the detailed neck line. When I tried it on, I was sad because there is no way I could wear this through my pregnancy - it was too short. :( The bottom part didn't flow right either - which could have been my belly, but it just didn't work. [five] Tart Maternity - Blaire Maternity Dress. 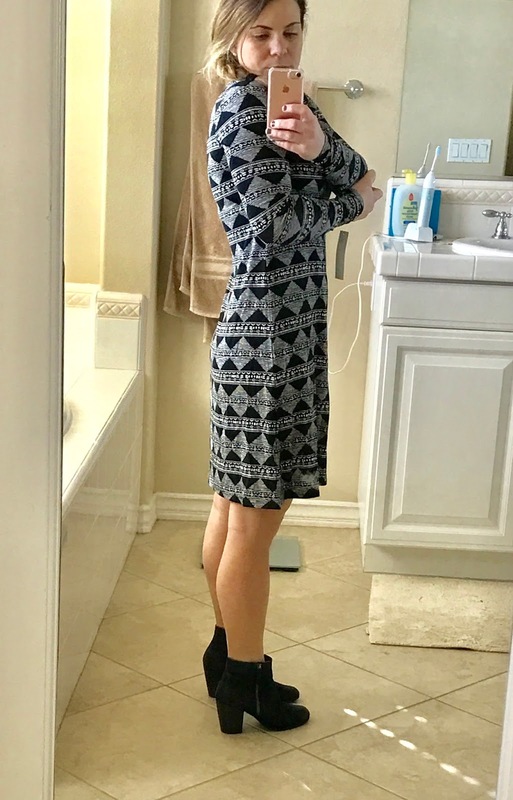 I am not a big dress fan in general, probably because of my height, but I was hoping this would be a keeper. It was a little tight for my liking during pregnancy and at $98, I couldn't keep it. Being that I only have less than two months left of my pregnancy, for my next fix I will be requesting all accessories (mainly necklaces). Hopefully, I will be able to add some jewelry to my wardrobe - it is definitely lacking right now. I hope everyone is enjoying their summer! [one] Rune - Kiley Maternity Ankle Zip Legging. These leggings were super cute and cozy, however, being that the rest of my pregnancy will be filled with beach and water play dates, I just couldn't keep them. I would definitely recommend them to anyone who will be pregnant in the winter months because they are very cute, especially with the zipper on the ankle and very comfortable. [three] Gilli - Astra Sleeveless Maxi Dress. The fit of this dress was good, but I wasn't all-in on this one. I am not a huge fan of long dresses on me (maybe because I am so short), so unless I absolutely couldn't live without it, or the price was on point, I couldn't keep it. [four] Loveappella Maternity - Plumeria Mixed Material Maternity Top. This top was definitely my style but if only it was a little shorter in the back. I didn't like the appearance of wearing a "shirt-dress" with this one. Other than the length, it was super cute. [five] Pixley - Colibri Heart Print Tab-Sleeve Blouse. Seriously? A blouse for the summer AND while being pregnant? No, thank you. Plus, the fit of this shirt had ZERO stretch to it so it probably would have fit only for a couple days...ugh, I hate gaining all my weight in my top half of my body. Want to get your very own Stitch Fix??? Click on the LINK HERE and give it a try. Fill out your own style profile now and then schedule your fix whenever you would like. Then you will receive five items delivered to your home for only $20. The best part is that you can apply that $20 to any items that you keep. It's so much fun! Cut chicken breasts in half, width wise, so they are thin. In a bowl, mix almond meal, finely chopped parsley & the zest of one lemon. Dip each piece of chicken in the egg and then in the almond mixture. Using EVOO, cook chicken in a pan on low to medium heat until cooked thoroughly (about 5-10 minutes on each side). The outside of chicken should be a light golden color.Optional: Squeeze the juice of the first lemon on top of the chicken while it cooks. Serve with second squeezed lemon. I served mine with broccoli and brown rice. 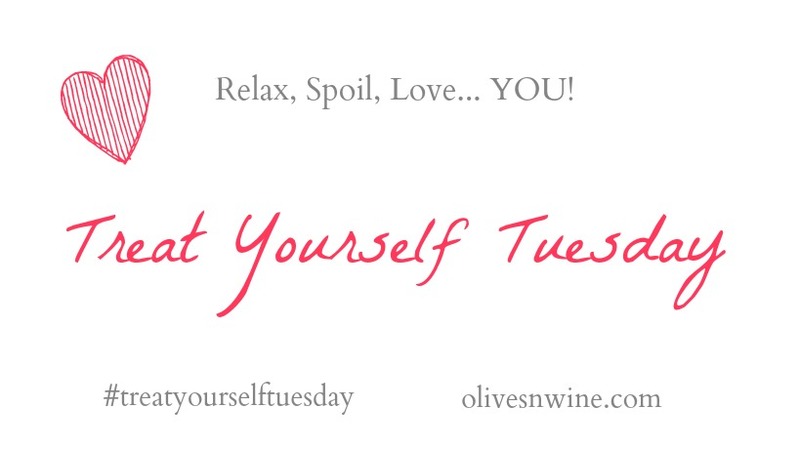 Linking up with my advo-buddy Becky over at Olives 'n' Wine for a Treat Yourself Tuesday post. This past week has been a busy one (just like every other one). Being a mom it's hard to treat yourself but I managed to get a little of that in this week. Since it was my birthday a couple weeks ago, I had some extra spending money and where did I go??? LuLu of course =) I got myself a cute pair of shorts for this hot weather. Check them out. AND, they are reversible! If you would like to try Stitch Fix out, click here. You can sign up and start filling out your styling profile. It's an awesome program where you get styled and sent clothes & accessories however often as you would like. You can either keep what they send you, or return it. Check out how it works here in my first ever stitch fix. [one] Market & Spruce - Sam Hi-Lo Short Sleeve Tee. This top was super cute but sort of plain. I figured for the price (I think it was around $45-50), I could find something a lot cuter. [two] Skies are Blue - Viper Plaid Split Neck Blouse. Initially I looked at this shirt and thought, "what was my stylist thinking?" but then when I tried it on I saw the full potential. This shirt was on the higher price point as well so I ended up returning it. Also, my box came after Christmas & this shirt just screamed Christmas to me. [three] Papermoon - Strewie Striped Mixed Material Top. O.M.G. I love this top!!! I definitely wore it right away on New Years Eve. I loved the solid back, striped front (I think I have a common theme with my tops that I have kept in the past - STRIPES), & hi-lo characteristic. This was a winner right out of the box! [four] Market and Spruce - Alan French Terry Asymmetrical Zip Cardigan. 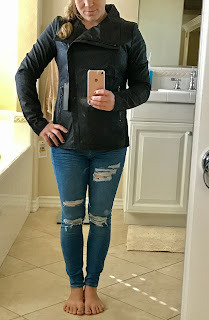 I thought I was going to absolutely love this jacket ever since I laid eyes on it on pinterest but I was actually surprised when I tried it out because it did not lay right on me. I liked the zipper on the side so that it could be worn on it's own, but something just didn't lay right. As an open cardigan, it was just alright. Therefore, I had to send this one back. [five] Loveappela - Evie Draw String Funnel Neck Sweatshirt. I had requested this item and I am so glad I did!!! 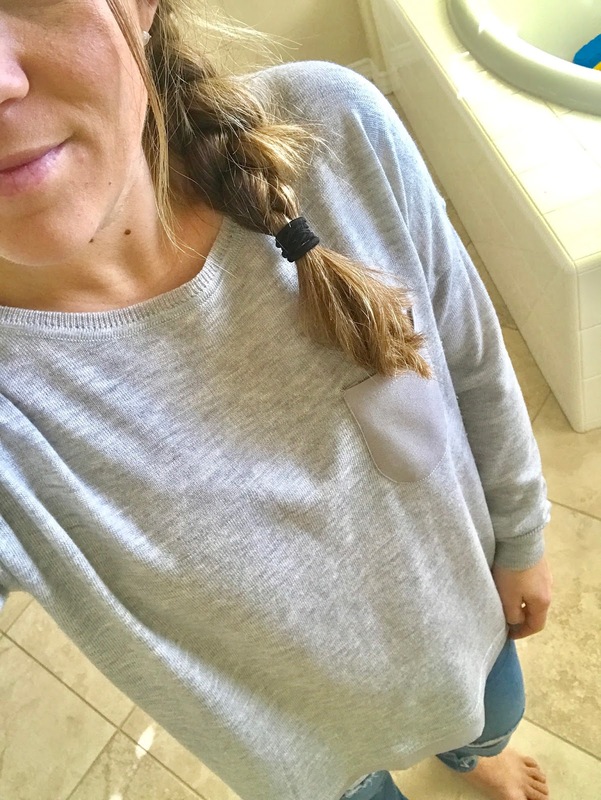 It is totally my style - casual and everyday type sweatshirt. I have already worn this several times and I am so happy I decided to keep it. It was on the higher price point but so worth it. And to think I had to question this one? ha! Definite keeper.